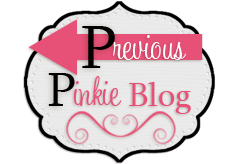 Every sight and every sound"
Well it certainly seems that way in my craft room at the moment as I have spent most of this week working on several Valentine's Day projects and todays post certainly fits in with that theme. I wanted to feature the Banner Blast Stamp Set (133551) and matching punch (133519) and decided to create a wreath to hang in my craft room. 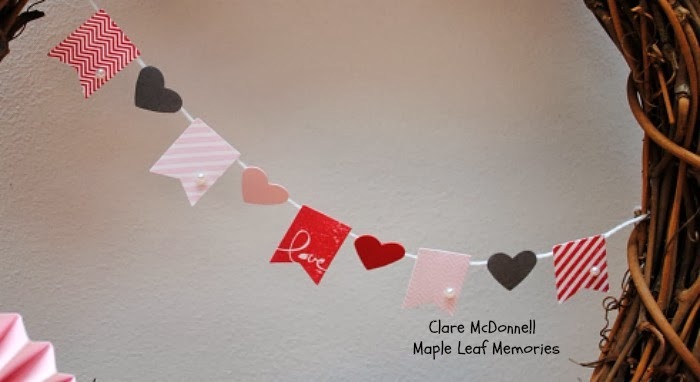 I stamped several of the banner images in Real Red and Pink Pirouette and punched them out before attaching them to some Whisper White Bakers twine, I added a few hearts punched out using the small heart punch between each banner. To create the large rosette, I cut two strips of Pink Pirouette 1 1/2" x 11 1/2" and scored them at half inch intervals using my Simply Scored board and joined them together. The rosettes can then be glue onto a punched circle using a hot glue gun to keep them in place. I punched out a circle of patterned paper from the Brights paper stack and a heart image from the Hearts a Flutter stamped in Pink Pirouette and cut out using the matching framelits. 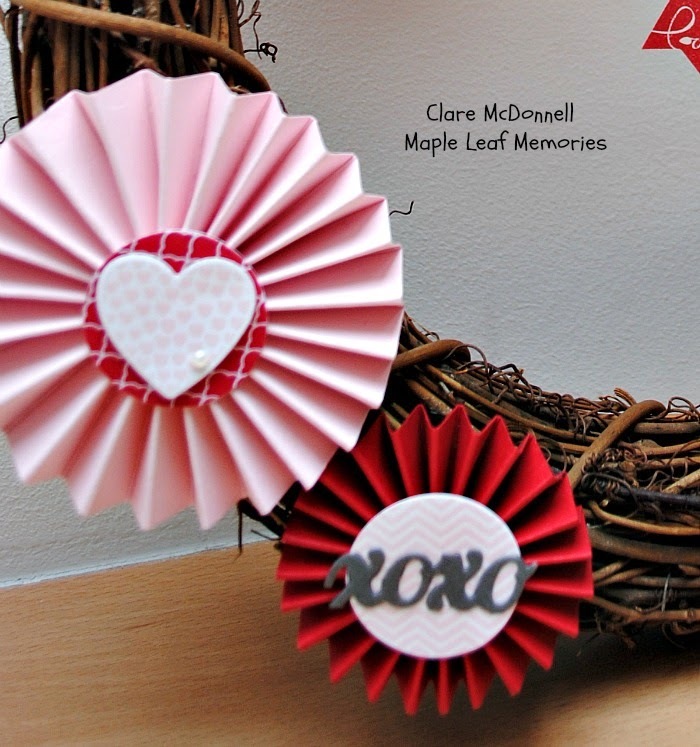 The smaller rosette was created in the same way as the first this time using Real Red cardstock, the kiss/hug sentiment was cut out using one of the framelits from the Circle Card Framelit set. 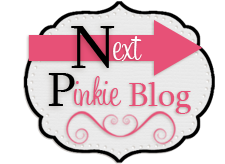 My finishing touch was to add a few pearls to the rosette and the banners. Thanks Sandra, I love the banner stamp and punch, I've used them loads already. 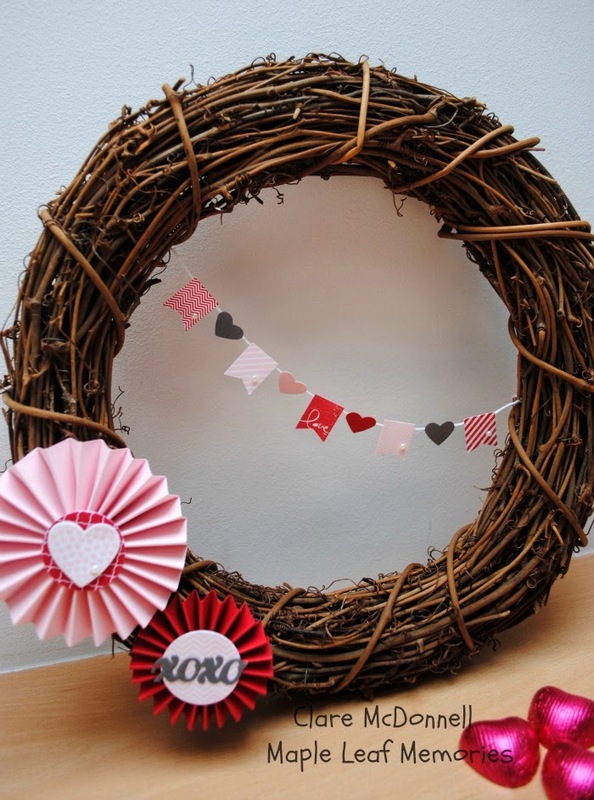 Such a lovely Valentine's wreath! What a great project! Really love the wreath! glad you enjoyed it Xandra. Gorgeous wreath Clare, it must look great in your room. Thanks Kat, I still have to get my hubby to hang it up for me.